TanyaMH | DO NOT feed the back packer! 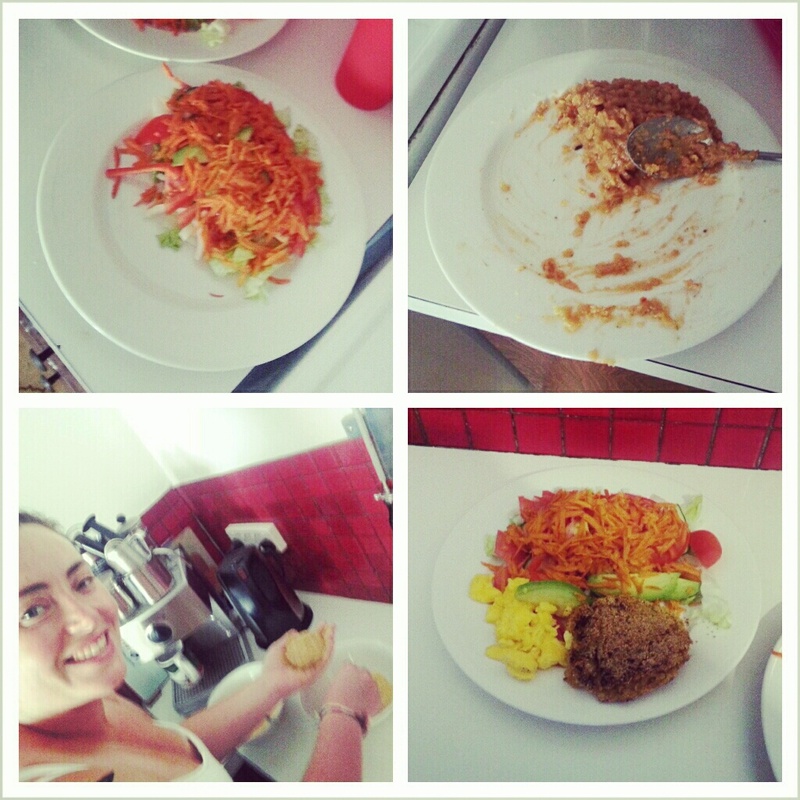 I'm just a frugal girl about to travel the world with Coeliac disease. I'm going to live my life my way! We had been to a friend’s wedding and had some time to kill before we saw Eminem so thought we would head up to the Blue Mountains for a few days and do some camping (sleeping in our wagon) while we weren’t to far away from safety. Armed with only a Camp 6 book, an unpaid version of WikiCamps app and a temperamental Navman we were obviously going to have an interesting time we intelligently set off on a rainy day. After a few hours stocking up at a local mall we made our way up and up and up. I couldn’t make any sense of the Camps6 book (I soon found out there were maps missing), the wikicamps app had a pin dropped in the middle of no where and the NavMan was being an a**e. We decided to check out a Free rest stop/camp area with hot showers as recommended by wikicamps users, there was just one problem…the app had two pins dropped at different locations and we ended up nose down a high hill leading to oblivion. It was terrifying and not what we needed in the dark and on our first night flying solo. Nevertheless we stressed and we moaned and we worried and miraculously we figured it out and found it. We chucked the stuff off the bed and hit the hay, we awoke to a cute little lake and a hot shower. You know on movies when something goes right and the person flings up their hands to the sky and a holy voice “AHHHHHHHH” erupts around them … it was kind of like that. We were alive and we would be clean. Great! So we set about making a coffee and sorting our new purchases into easily reachable and safely stored locations. I made a few modifications to the wagon and asked Anita to check the lights. She did and she did a good job. Such a good job that she left the things on and killed the battery. That elated feeling I had earlier was replaced with dread, a bit silly really considering we had bought a jump starter…but do you think either of us knew how to use it?!? Not a chance! Anita disturbed an Aussie ranger on his lunch, it was something akin to trying to break a lion away from a gazelle. He was not happy. Nor was he happy when Anita refused to pick the jump starter up because she is afraid off batteries. We must have looked like the biggest fools, however, not entirely our fault. We looked at the instructions and they were confusing and the ranger knew what he was doing so we let him (everyone’s got to learn somehow, right?). 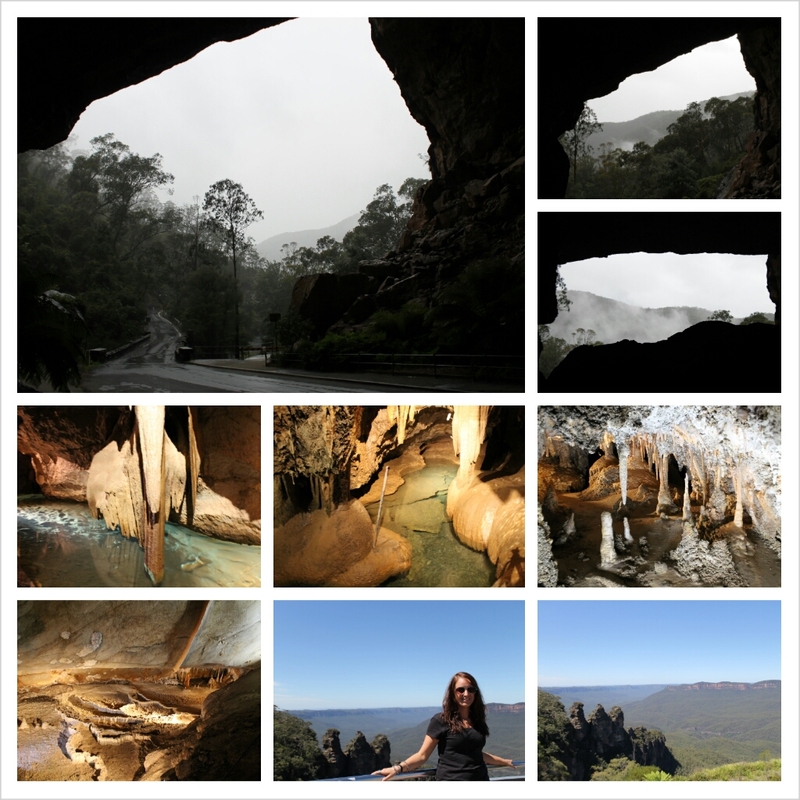 So angry ranger gone, engine running and stuff packed to headed to our next destination…Jenolan Caves. Diving for 2 hours on a road so winding and narrow I couldn’t actually look down at some stage, the scenery of the hazy mountains was idyllic. We kept seeing signs for the caves but didn’t seem to be seeing much of anything else on the Jenolan Road and we were beginning to get a little worried because it was getting to late to turn back. Confused again we were silent then all of a sudden both of our jaws dropped into our laps as we drove through the grand archway of Jenolan Caves, a huge passage worn into the mountain by millions of years of running water. We were so exited to see the beautiful place. We parked up and booked a walking tour through the Temple of Baal cave to see the natural crystal formed in the chambers, the temperature 15.2 degrees was perfect. There is some really amazing crystal to be seen and a beautiful shawl called the Angel’s wing that really is spectacular. We asked if there was somewhere we could stay overnight to do another tour the following morning, it just so happened they had a 2nd car park located up the hill with BBQ’s and a hot shower. All the tap water is natural cave water and perfect for drinking. Again we had been lucky. So we had a BBQ with a local friendly parrot, who seems to make quite the impression on visitors, and we slept. When we were ready the next morning we decided to move the car closer to the bathroom and do the hillside walk back down to the cave office to book another tour. 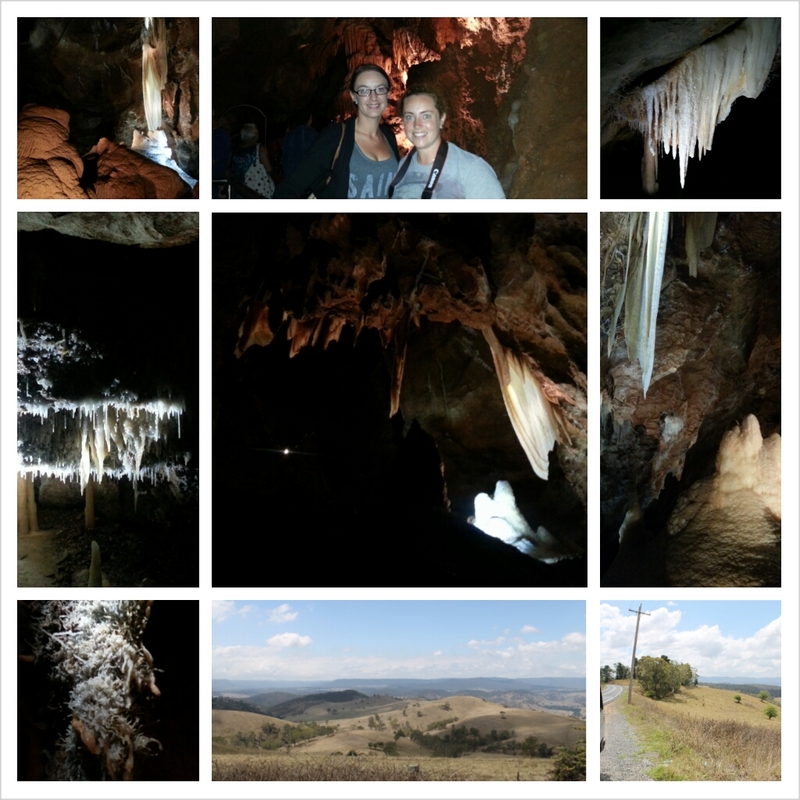 We booked The Imperial Diamond which was a marvel of tunnels and chambers and the cave river that is stunning. The moment we booked the tour the heavens opened. It was 11am and our tour was at 4pm and it was a 45 minute hike back to the car with Anita’s new camera. The rain was not letting up so we resided with some other visitors and dossed about the Grand Archway taking pictures (a lot of them) for a while. It wasn’t that bad just cold, we still enjoyed the day regardless and the site staff took pity on us and graciously gave us a lift back in the staff shuttle. We so we decided to stay near the bathroom and we settled down for the night, only to be woken by strange noises. Kangaroos, wombats and an unbelievbly loud thud. We couldn’t figure out what it was but it scared the crap out of us. We found out in the morning that due to the rain a tree had decided to uproot and park itself in our spot from the night before…again lucky. 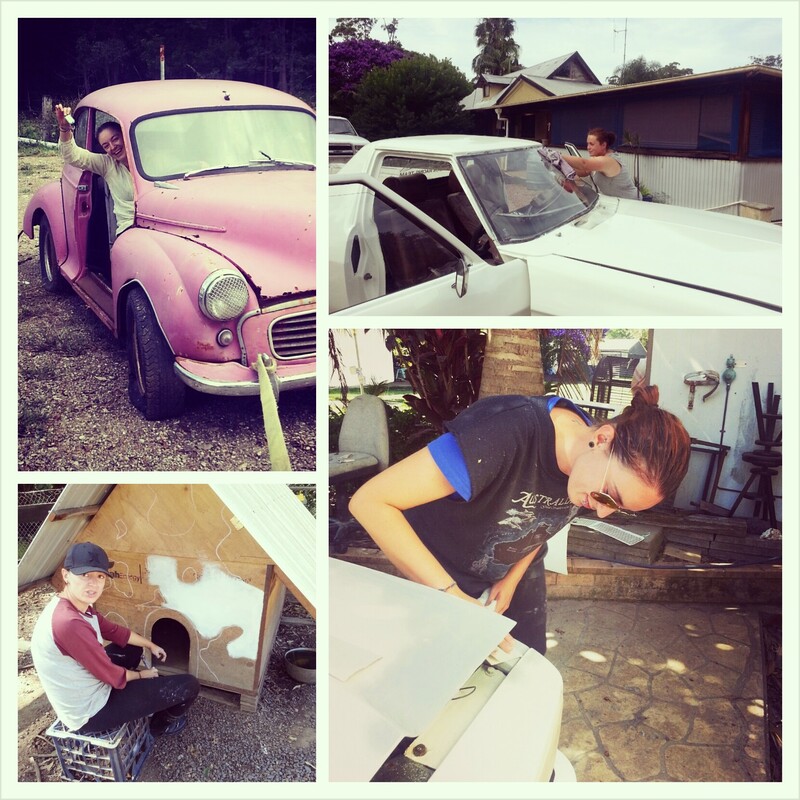 We packed up and headed out to destination Wentworth Falls. We stopped on the way at Katoomba to do the general tourist shots of the 3 sisters, we went for a lovely hike at Leura Cascades and put Anita’s new camera through its paces. 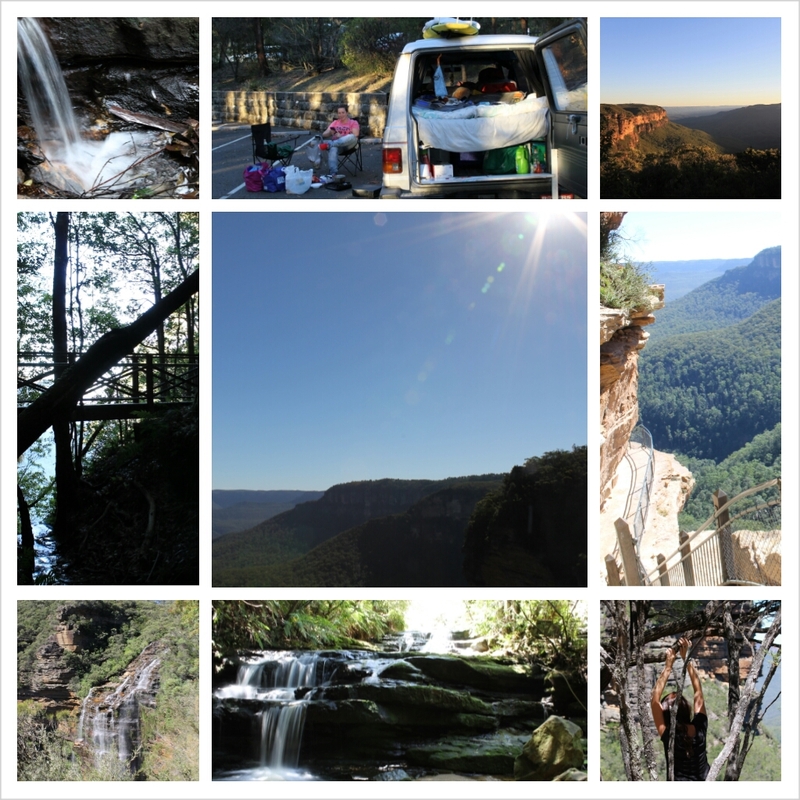 Finally hitting Wentworth Falls late in the afternoon … again. This late in the day arrival stuff just keeps happening to us, I think we are too easily distracted on the road or Anita drives really, REALLY slow. You can be the judge over the next few weeks. We headed part way down the falls and marvelled in their beauty and in the difficulty of the trek to the bottom, one that we were not willing to undertake at sundown. It was disappointing as we could have sat in the rock pools and viewed the falls from the bottom and we had to go back to the city the following day. So we walked a few smaller tracks and decided to stay in the carpark (not officially allowed but no one bothered us, because there was no one there). Waking up their early morning was something special, we took a few of the shortcut trails to take in the sights and the fresh air. Just us, before the tourists arrived to get their heads in your perfect view and spoil the silence with their chatter. To stand looking over the mountain range in silence taking it in with every sense was unique and definitely something I will not forget in a hurry. This trip was fun, there was just one little detail…we had no signal and our favourite Sydney hostel (which we were booked into) had a secret gig there by the one and only GREEN DAY. We only got the text the morning after, the only word said…NOOOOOOOOOOOOOOOOOOOOO. Beside that we had a blast and we are so excited for the next adventure. We then decided a 4 wheel drive would be better than a camper, in case we get stuck or encounter many of Australia’s “chicken” playing native species. We found a beauty on a search of good ol’ Gumtree. $xxxx for a 1989 Mitsubishi Pajero including full years rego, surf board, snorkel & fins, DVD player, cooking utensils, gas stove, tarp, solar shower, etc. It even had a double bed in the back because the seats had been ripped out. It was perfect. We took a day trip to Bondi and asked the guy a few q’s, had a little look around and we were satisfied that aside from needing new wipers and tyres we were set. Anita offered him $500 less than the asking price, he accepted – we thought we were on to a winner. We checked the paper work, we had a vague idea of what we were looking at and we saw that there was a one year safety check – supposedly a pink slip. He kept hold of the rego paperwork to complete the necessary details…until his money went in. Let’s just say we were a little naive and our research was obviously less than sufficient because we soon realized when we received our part of the paperwork that the car was not registered. More to the point it expired the day we bought it! So it was time to panic, there’s no where to park where we work or live and we were sure to get a fine. We had 14 days to register the vehicle before we had to have further rigorous tests on it, so off to the RTA we went. My advice to anyone travelling Australia and wanted to buy their own vehicle to do so is research before you start looking and then make informed decisions. 1 – Check the advertisement and take a screen shot if you can, because as soon as you buy it you can bet your but it will be removed from interwebland. 2 – Ask for the registration number, you can check the validity of any vehicle registration here. Green Slip – This is your compulsory insurance to cover 3rd parties in the event of an accident. You can chose the level of cover to suit you, it is a legal requirement to complete re-registration of a vehicle. Be aware it does not cover you or your vehicle for driver caused damage or theft. For more information look here. Vehicle Safety Check / e-safety check (formerly known as a Pink Slip) – This is a standard safety check for vehicles over 5 years old. It can only be completed at a registered station and an e-safety certificate will be issued to the governing authority. Where your vehicle does not pass or needs work on it you will be issued with a Repairs Required Notice (formerly a White Slip). These repairs must be made within 14 days of the notice if the vehicle is to be registered. For more info on Pink Slips look here. Requirements differ from state to state as does the documentation. Our vehicle is registered to NSW and the information here is primarily relevant for NSW, however, you must check the requirements if your vehicle is registered in NSW and then will expire in another state you may need a new safety check to register the vehicle in another state. If you need to register a vehicle before you set off on your trip plan ahead to where you expect you will be when your rego expires as you could be hit with unexpected costs to make your vehicle legal again. Don’t learn the hard way. I know I am well overdue for a blog post, a lot has happened since my last and a lot has changed. Especially me. It really is a refreshing experience when you learn more about yourself and what you are prepared to do, tolerate and strive for to be a happier person. For me it started when I left Sydney to complete our regional work, it had its ups and downs and really hit us hard in the face. I knew we would change here and that the experience would be one we would not easily forget , but I wasn’t sure how and I certainly wasn’t sure if I was ready. Committing yourself day in day out to the needs of strangers for 3 months is not an easy choice and all sorts of doubts enter your mind, but if you want that coveted second year working holiday visa you have to make the choice. Before I start my tale I won’t go into details of the people we worked for, nor will I mention the company name or post any pictures of them and their children. Respecting their privacy is as important to me as it is to all of them. We left Sydney on the 17th March 2013 and hopped on a train to mid-north NSW, the train ride was filled with trepidation, curiosity and down right fear…I have heard of the movie Wolf Creek and the fact that it was based on true events, also other people delight in telling you how there is nothing in most of the rural areas of Australia and that you are all alone! So obviously I imagined how long it would take my parents to learn of my disappearance. Ok a little melodramatic and I am sure they would notice if I didn’t place any pictures on Facebook or send them a Birthday card, they would wouldn’t they? Right? So here we begin 3 and a half months of learning, making new friendships, arguing and almost getting seriously injured on a number of occasions. Being collected in a dirty 4 wheel drive by husband, wife and 5 of 8 children I was a little intimidated. Names were being thrown around everywhere and hyperactive faces were gleaming at the two new backpackers. On the way to the land the Husband “Mr P” decided to try to intimidate us a little, I immediately turned into my no-phased cocky teenage self from way back when (just throwing a little attitude out there), he wasn’t happy about that so he wanted to test me. On the way up the drive I had my first encounter with the animals that were to be my enemies, my friends and my lifelines for my time there. Mr P told me to get into the paddock with 3 pregnant mares and retrieve their food buckets, his wife Mrs P told him not to. Again cocky teenager in my brain thought “I’m not afraid, let’s this”. The horses didn’t see me and as soon as they did I had hold of buckets, obviously they thought I had food and came at me. Waaaaaah freak out, buckets in one hand other arm up in the air. Once I made it out alive and reconnected the electric fence it turned out I did the right thing and I had a natural instinct….to not die! 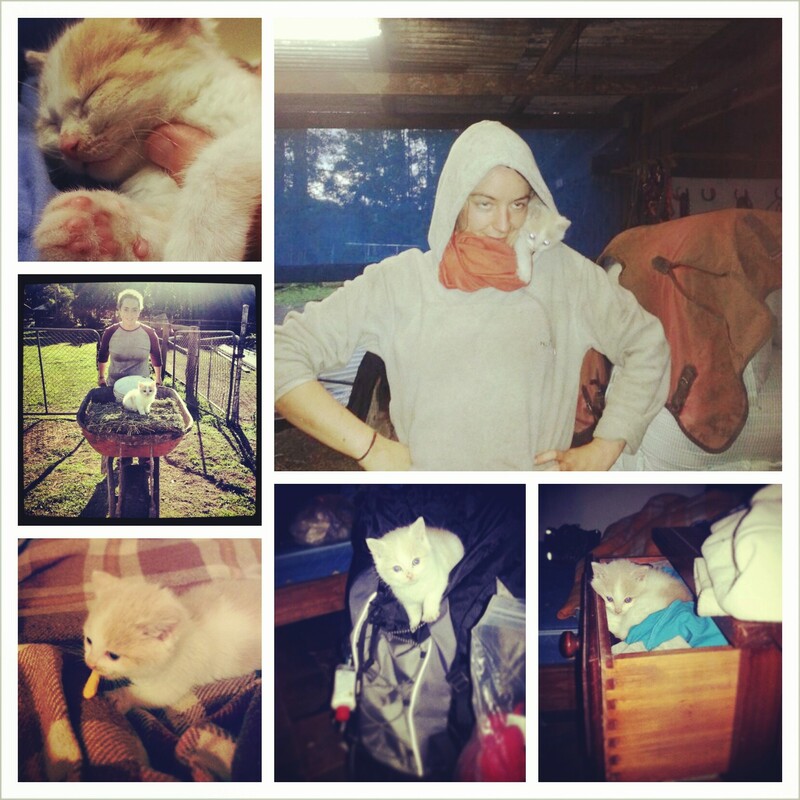 Our time on the farm was to be spent waking up in our caravan, feeding 30+ horses, cows, pigs, sheep, chickens, dogs, rabbits, cat and our very own kitten their breakfast, helping with any job (from babysitting, panel beating, cattle chasing and butchering) then feeding them all dinner again. The diversity of what we did astounded us. Some of these jobs completely altered my perception of certain things and I learned so much from such accomplished people. 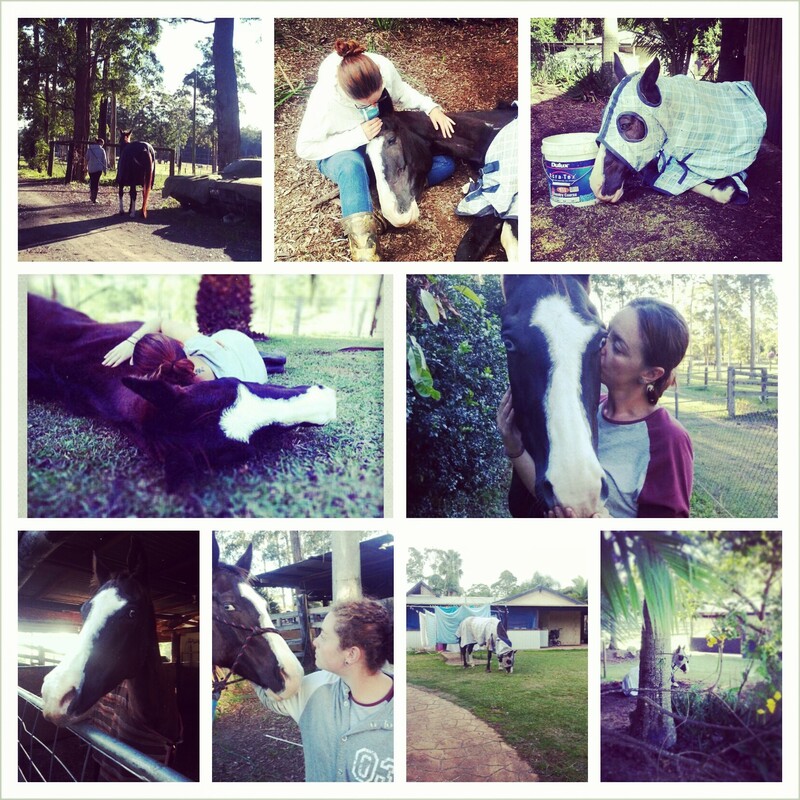 I appreciated the chance to get close to such beautiful animals and really begin to understand and work with them. Watching Mr P, who actually is the real horse whisperer, work the horses was unbelievable. 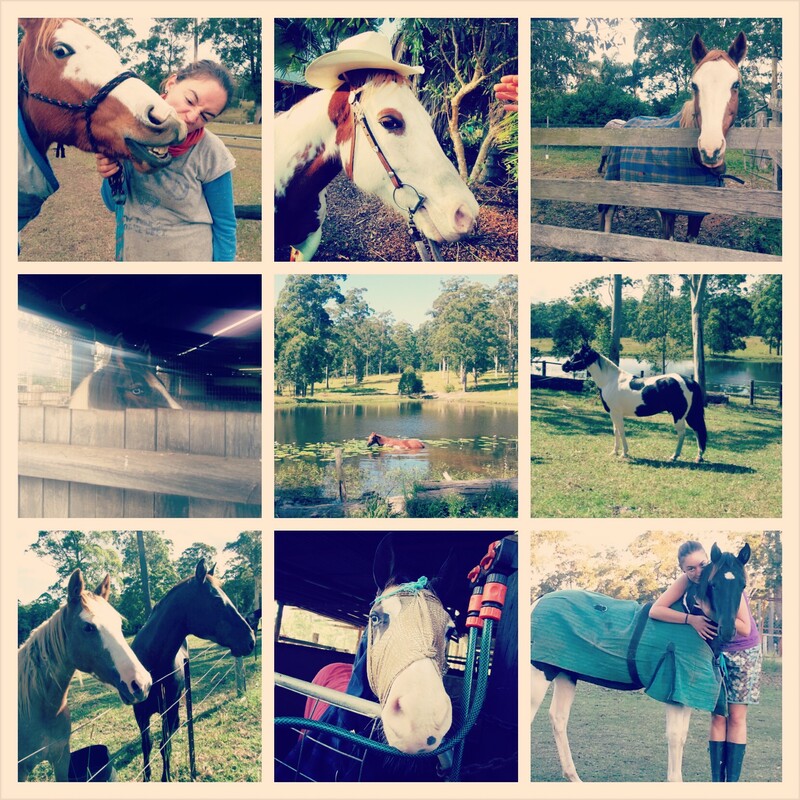 My love lied with one horse, a disabled 9 year old paint horse who had a story to break anyones heart. She won shows and was Mr P’s pride and joy, even taking her into the bedroom of his son one time he was sick. On a trail ride she broke her pelvis and he slept by her side turning her over on old mattresses until she healed. When fixed the mischievous mare got her way into the feed bin and ate so much she developed chronic laminitis. She could hardly walk and had bed sores galore. She was a sorry sight but had an attitude problem to match anyone. She became my best friend. I fed her, cleaned her, nursed her seeping wounds, lay with her, made sure she was warm and dry when I could. She gained weight and begin to stand up straighter, I was winning. So much so she walked around a hell of a lot more and decided she wanted to eat the dog’s food too, it was as if we had to watch a curious toddler. She wasn’t in a paddock she was roaming around the washing line, the garden and our caravan. I even heard her snoring some nights. In this place I discovered more compassion than I knew I had and fell head over heals in love. She was demanding but she was easy. The farmer obviously had a family to feed, meaning home kills were a necessity. I was not prepared for this and no matter how much I tried to tell myself I could deal with it I couldn’t. I couldn’t be around it. Anita stepped up to the plate for me and to learn what her Grandad was too old to teach her when he had his own farm many moons ago. After being there for some of it, being around a pregnant cow who came for cuddles when she was in labour and another who loved attention, seeing a calf born and seeing the helplessness of calves from the dairy industry at the markets – who once was a meat eater stopped eating meat. I couldn’t do it anymore. The pain, the guilt and the tears made me not want to do it ever again. I have not eaten meat for 10 months and I do not look back. They understood, Mrs P was a vegetarian and by no means did the family take where their meat came from for granted. The animals were more than well looked after. 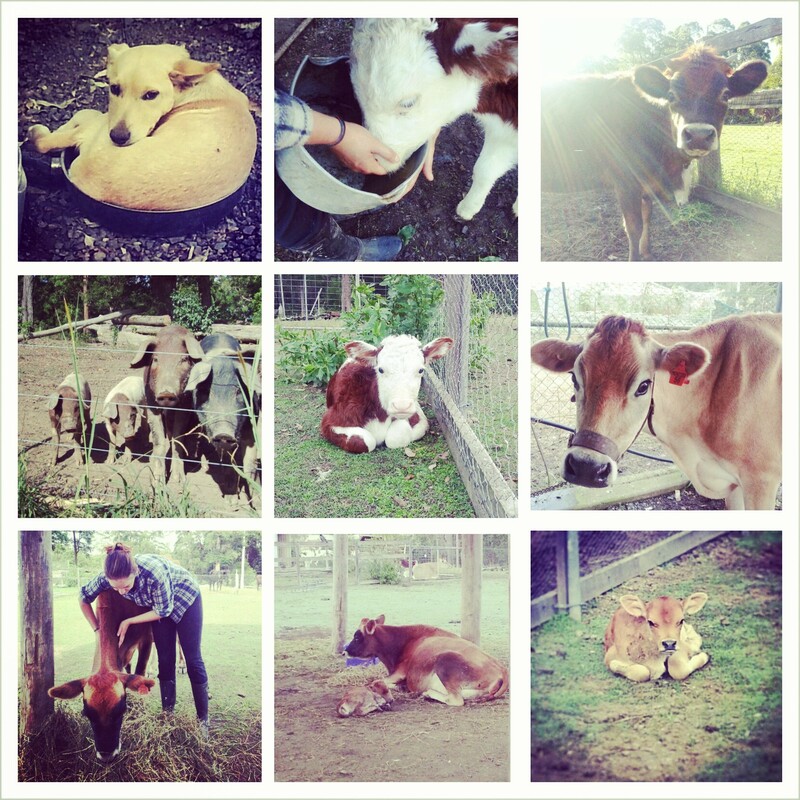 But I realised my love for animals out weighed my love of meat, so it was an easy decision. I connect with them and we soon discovered Anita is the one who shouldn’t be allowed to work within close proximity to anything that is living. I mentioned we nearly got hurt a number of occasions, well the only thing I got hurt with was myself and inanimate objects.I nearly got crushed a few times, I nearly copped my own fingers off with a machete and I nearly fell off a roof. Pretty standard stuff for a clumsy nugget. However, Anita had some dozy moments to be proud of. Rule number 1: if you have a horse on a lead, it tries to bolt and you have no lead left – let it go! Not Anita, she thinks holding onto the rug of a horse is a suitable way to respond resulting in her being dragged from the stable. Rule number 2: if you open a gate of a paddock and there are large living animals in that paddock – shut the gate. Not Anita, she lets the entire herd of cattle out into the driveway and house yard so we have to spend the best part of 5 hours on our own chasing them away from the feed shed and the garden. Rule number 3: if you have an animal on a lead (such as a cow) – do not put food into it’s container until the holder of the lead is safely out of harms way. Not Anita, she thinks the food will keep the cow in one spot so you can control her and not that she will twist and turn and crush my fingers in a lead because she wants dinner. The only animal she got on with was a cute little harmless kitten, actually she was OK with anything smaller than the Ridgebacks. Magnet became our little pet in our caravan until he could fend for himself a little. We loved him terribly. With their family we became family, we became their daughters, their siblings, their aunties and most of all their friends. And did we all argue like it too. Arguing and bickering is unavoidable in such a dangerous environment where the work we do is their life and you are apart of it day in and out, 24/7. 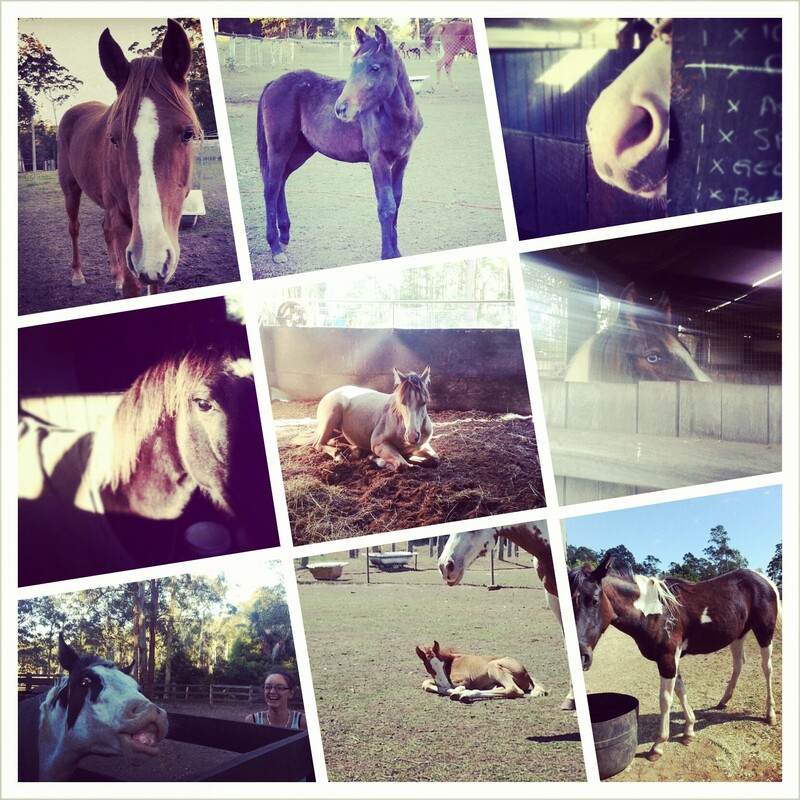 There were fun times like having picnics and fires with the kids and there were hard times like when one of the mares lost her foal due to paralysis tic and I thought I hadn’t treated them correctly. But the hardest part was leaving. Leaving the animals and people that made it such an amazing journey. There’s so much more that happened that I haven’t got the space in this blog post to write and that will all be forever in my journal. But backpackers know this, there are many places to do your regional work. Some that pay and some that don’t. You need to complete 3 months in one place or 88 working days in multiple places, some pay and some don’t. Although everyone would love to get paid for the regional work that they do, please do not let that put you off doing work exchange and woofing because these people really need the help too. Probably more. No matter where you go you will have the experience of a lifetime that most would never get the opportunity to have at home. I know I wouldn’t have and that’s why I’ve already been back and I am going back again. To my new Aussie home. We found our regional work by completing a membership with Travellers At Work, all the adverts are live and the staff are brilliantly helpful. You must make sure that the place you are going to has a registered and valid Australian Business Number (ABN), you can check the status of an ABN here. Take your forms with you, you need proof that you have worked there in case the immigration people check your visa application. Get them here, you can also apply for your visa online. Remember to agree working hours before you start some farms will take you for granted if you allow them to and some will hardly ask you to do any work, the main priority is to make sure your required days are covered doing a qualifying job in a qualifying location. OK, so I know I am a little bit late with this post but I do hang my head in shame and pray you accept my humble apologies. I have been having the most unbelievable problems getting a signal on my phone to post and it takes a long time to type on a Galaxy S3. I know youre all thinking excuses , excuses but I really am struggling to do much better. Anywho! This post is all about the first and only 16 nights (consecutive nights) I have stayed in Sydney in the 5 months I have been in Australia. I have just completed my 3 months agricultural work and will post all about that soon enough. This post is an update for friends, family and readers alike of what I have been up to. It started on the 1st March, we arrived early and headed to Alfred Park Budget Accommodation (Trip Advisor review here) and placed our things in the basement before we left to explore the area. This was when we found Organic Produce for a great slice of gluten free banana bread. We were waiting for a friend to arrive from Brisbane to join us for the Mardi Gras, due to her delayed flights we missed the Bondi Beach drag races which I had planned to go to. The hostel over booked and we were moved out, due to the move and needing to check back into the hostel I also missed the 9am fun run on the 2nd March. However, all was not lost! Some pre-afternoon drinking begun and we soon got into the swing of things. We spent a good amount of time and money in the Columbian Hotel on Oxford Street while waiting for the parade to start, our friends were in the Dykes On Bikes section of the parade so naturally we wanted a good spot on the fence and the pub seemed like a great place to wait out of the rain. When we did go to the fence we looked amazingly stylish in our red, yellow and blue ponchos. We were the envy of the crowd Im almost positive. The parade was AMAZING and it really does give you a sense of pride to be open minded and be around other open minded people without any prejudice of any kind. People who just want to be themselves and support one another. It sounds cliché I know, but it is true. I got goose bumps when the armed forces paraded and when I saw lots of happy parents and children enjoying the celebrations. After a lot of hours standing we got changed and headed to an after party in Newtown at the Imperial Hotel. Some of the Dykes were members of the band that were playing and we paid the $30 entry, it was worth every penny. I didnt catch their name due to high levels of alcohol in my bloodstream but I will try to research and get back to you. The following day consisted of getting in at 6am, up at 1pm, bed at 6pm up at 9pm and back out at 11pm until 6am all over again. Wow that was heavy duty drinking. So know we are on the 4th March and spent the day allowing our friend from home gracious time to quickly see Sydney Harbour, the Botanical Gardens and the State Library of New South Wales where there was an odd exhibition showing hundreds of centuries old photos. It was all taken at a quick glance and it was quick! Seeing as we were hoping to be in Sydney for a while we decided it wise to be looking for work, we tried the usual backpacker places to look yes this includes Gumtree! We quickly got bored of browsing and had an early night to make up for the late ones, I think I really am getting old. 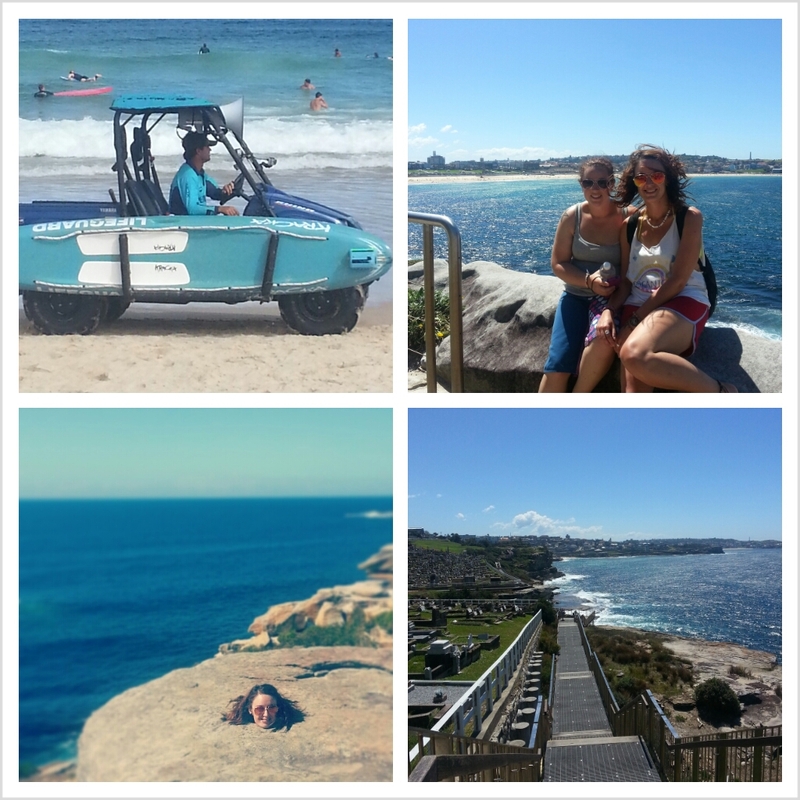 The 5th was a good day for us, we hopped a couple of buses and sat our bikini clad butts on BONDI BEACH, yes I am a massive geek who watched Bondi Rescue on Pick TV when I am at home and yes I was so excited to see the guards and even more excited that they yelled at me because I wasnt near enough to the flagged zone! I do not recommend swimming in unsafe areas, I just didnt realise at the time due to excitement still smiling a little inside. Between the 6th and the 8th we went back to Bondi twice, I got my nose pierced and we really got into the whole looking for work thing (view my post here). We signed up to TAW (travelers at work), which we thought would be more helpful than Gumtree and at least more genuine than some of the weird folks out there. All the way up to the 8th we had been searching for hostels for the weekend coming, there was one problem none were available and hotels were going for $300 per night. Considering it would cost us that for two of us in the hostel for the week we couldnt afford that. So we were stuck with two nights and no where to stay. We had no idea what to do next and almost half expected to join the backpackers under Eddy Street bridge. All was not lost, we managed to secure a room at a show house belonging to someone we knew and all we had to do was make sure all our stuff was out of sight and not use the bedding. Phew! So we loaded our lockers and took a weekend bag ready to hit Future Music Festival 2013 my little early Birthday present to myself. So we get to Saturday 9th March and we head off to Future Music, we set off early ( as always) to make sure we were at the front of the cue to hit the stages, we really neednt have bothered. It was a very hot day, so hot that Neet burnt her eyeballs from looking at the stages all day WEAR EYE PROTECTION! Go faster stripes arent a good look on eyeballs, trust me! 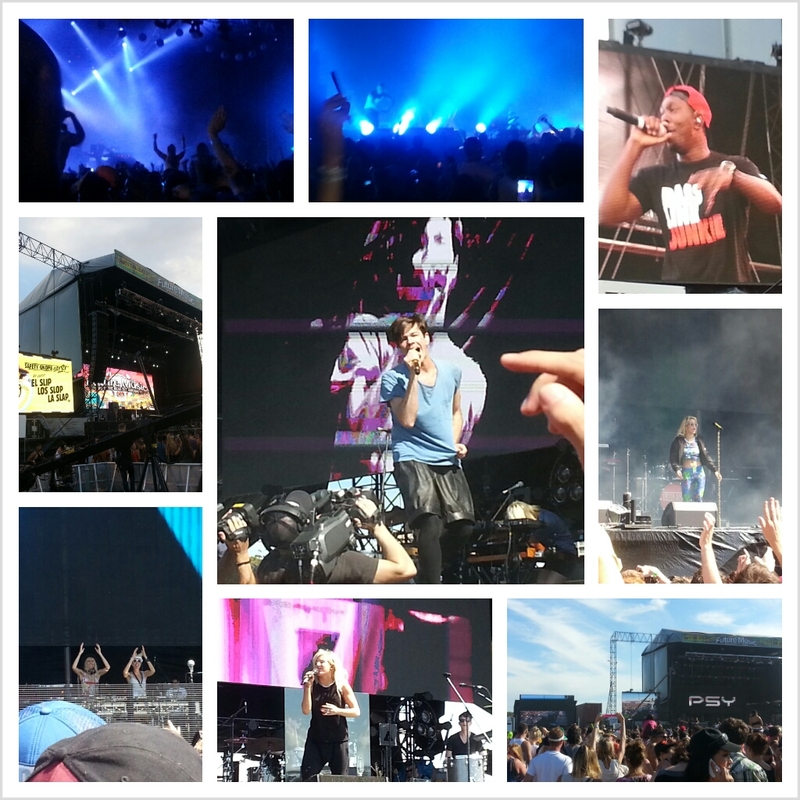 During the day we saw a heap of amazing artists including Ellie Goulding, Rita Ora, PSY, Nervo, Rudimental, Dizzy Rascal, Madeon, Azealia Banks (we kind of heard her when she eventually arrived on stage), Gypsy and the Cat, The Prodigy (yes I was bouncing like a nutter) and Fun. My highlights were doing Gangnam Style with PSY, singing my heart out to Fun. and jumping around to the harsh sounds of the Prodigy! The worst part of my day was poisoning myself with an energy drink, I was so thirsty at 11am and the bars werent open for alcohol so I thought Id have an energy drink. I would usually check the ingredients of most things I consume but for some bizarre reason I didnt, I could blame the excitement but I was simply too idle to read. BIG MISTAKE! The V energy drink contains WHEAT whyyyyyyy??!!! I just wanted a little pick me up, I had no coffee in the morning and knew it would be a long day.. Drinks are beginning to be my enemy and gluten free nightmare! I had to settle for cans of Strongbow pear but the cans were small and the price was large at $9. After a hard days singing and dancing my body had had enough, due to gluten my immune system dropped and allowed in the onset of a cold which came with a heavy chest. I felt like my Converse, rough, dirty and done in! Things looked up though, Anita got a call about an interview for the Wilderness Society on the 11th and we decided (due to speaking to some new friends at the hostel) to actually try to sign up to Medicare (see this post for more details). Anita didnt get the job, but we did get Medicare cover sorted which was a weight off our minds. After a couple of days wondering around and shopping (I was torn with the decision of sticking with my phone or buying an iPad or small netbook), we made plans to meet our new friends in the morning for the coastal walk between Coogee beach and Bondi beach. Its roughly around 7km and at a snails pace of discovery and picture taking with Amy (a lovely girl taking her last chance saloon shot at backpacking) and Rebecca (the hostel resident who is a bit of a hippy that cant seem to leave Sydney but is such a funny and sweet girl). On the way we found some interesting places, like the concrete beach at Gordons Bay, the beautiful Bronte Beach and the great cemetery. We stopped at Bondi and indulged in one of my average gluten free lunches of carrot sticks and dip, this time I decided on smoked salmon and dill! Yum! We finished the evening off with a well earned box of goon and some stir fry made with gluten free vermicelli noodles. Following our exertion and minimum walk of 5km per day we decided to hit the shops again on the 14th, this time we stayed around the CBD. The day held a surprise though, in the form of a phone call from a lady offering us our 3 months agricultural work for our second year visas. The only thing was we were to leave Sydney on the 17th. Our last full day in Sydney had to be something we hadnt done yet, we decided to hop a ferry over to Manly and see the beach. There was just one problem, the beach was closed!! The surf was hectic and the coast was foggy with mist, thats not to say the place was quite, it wasnt. It was so busy! We caught the little market come car boot sale and then had lunch. We wondered through the high street that also had a market containing organic produce, original arts and beautiful jewellery. I had my first baby Thai coconut and almost died with pleasure while drinking it, I seriously have never consumed anything quite so amazing. I have a prediction of my favourite beverage when I hit the shores of Thailand. The main beach was closed the entire day, however, we did manage a dip next to the ferry port before heading home. 17th March 2013 we caught a train to Tarre and hoped for the best! During these two weeks in Sydney it felt like we didnt do all that much, or see all that much of the city and the surrounding area and I dont doubt there is a lot more to do. You just need a lot of money and time to do it and the trouble with being a backpacker is money spends all too quickly out here. I do like Sydney and I would like to spend a little more time there but what my friends told me back home was true dont spend too much time in Sydney, its overrated . I would like to experience more culturally and slow down instead of always being in a rush, so far I feel like my time is slipping past me quicker than I can blink and I just want to take it in a little more. So to begin my short posts on tips for British Backpackers coming to Australia I thought I would start with medical care. As it is something important but no one ever seemed to know the answers to any of my questions. Most peole believed (as I did) that we are not entitled to any form of free or subsidised health care in Australia….well that would be wrong. In fact we are. We are, as British Citizens, entitled to some healthcare services via MEDICARE. I had no idea and for two months havent been signed up. Nevertheless, I am going to be. We are entitled to medical treatment and reviews of a necessary nature for the duration of our stay. All you need to do is go to a Medicare office local to you (I went to 135 King Street, Sydney) with your passport and a PRINTED copy of you visa then fill in the enrollment form, they will not accept electronic versions on smartphones or tablets. I would advise you to go as early as possible to avoid the cues, however, it may be necessary to make an appointment to return. You can also download the form and call for an appointment if you don’t fancy waiting around. HERE is the information from Medicare I didn’t have, I can now pass it on to you my lovely readers and fellow backpackers. To all of my readers, I must appologise for not keeping my posts updated. I have a few waiting to be published, however, I am currently working on a Stud Farm for 3 months to complete my second year visa work in Australia. I have very limited internet capabilities as the signal on the farm is very poor, so please be patient with me and I promise to update you guys as soon as I possibly can. So here is the first of what I hope will be many backpacker recipes and food ideas. Being a backpacker is hard, food is expensive, you have limited food storage space, the possibility of it getting stolen or used and contaminated by other backpackers and there may very well be limited cooking appliances and utensils. So far it’s been fairly warm so we have had the ease of eating salads and thanks to my flexible friend…my own little travel chopping board that my amazing mother-in-law bought me, I can chop anywhere safely! Win! GF Tip: buy your own flexible lightweight chopping board! So along with salads what else can we have that is cheap, easy and packed with protein …Lentils?? But not just any lentils, how about Mediterranean lentil burgers? They are simple, gluten free and vegan to boot! Anita made them while I directed and chopped salads so it really was a team effort as it usually is these days, so heres how we did it. 1/3 cup of polenta (ground corn meal). Add all ingedients except the polenta to a pan and bring to the boil until the lentils have completely absorbed the water and reached a”mushy” consistency. Place them on a cold plate to cool and then spread the polenta on a clean chopping board or plate. When the lentils are cooled, spoon off palm sized portions and shape the burgers (yes you will get messy at this point). Once you have the shape coat them in the ground polenta to make a crispy skin. Once you have made all the burgers simply fry in a bit of low fat spray oil or olive oil until golden, the burgers can then be served hot or stored and served cold within a couple of days of being refridgerated. I tried both ways and must say I preferred them cold as the cooling down helps them to set. We had limited kitchen space and storage but if you are makimg them at home try making them the day before, but do not fry, just store in a container with grease proof paper to set and then fry when you want to eat them….and of course leave comments and let me know how they work for you. We arrived in Sydney on Friday 1st March and after some time sorting out our hostel booking we decided to scope out the area. We had heard Surrey Hills was a beautifully chic area so we trotted on down. It was raining heavily, I needed caffeine and a toilet. Hard luck … virtually no cafes in Sydney have toilets, the majority are hole in the wall stop-offs or Seven Elevens purely for convenience. Then we stumbled upon this beautiful little miracle with a friendly gluten free sogn o the door, it really was the best find ever. Inside is small and as you walk in there are shelves upon shelves of organic and allergy friendly produce. There is also a deli counter at the front with an array of gluten free items, there were wraps, cakes, muffins, sandwiches and banana bread. I was literally spoiled for choice. We sat toward the rear near the open kitchen and we could see the staff frantically preparing the fresh wraps, it was nice to see a venue take pride in their food preparation for a change and not hiding behind closed doors. This was where we realised that the delicious looking wraps up front were not made with tortillas but with wafer thin savoury crepes. The atmosphere was cosy and the free water and table service made a rainy day brighten up a little. We ordered a flat white and a slice of banana bread each and at a total bill of just under $20 I thought it was slightly expensive, however, I am a backpacker and local prices are high for anything that has a special edge. 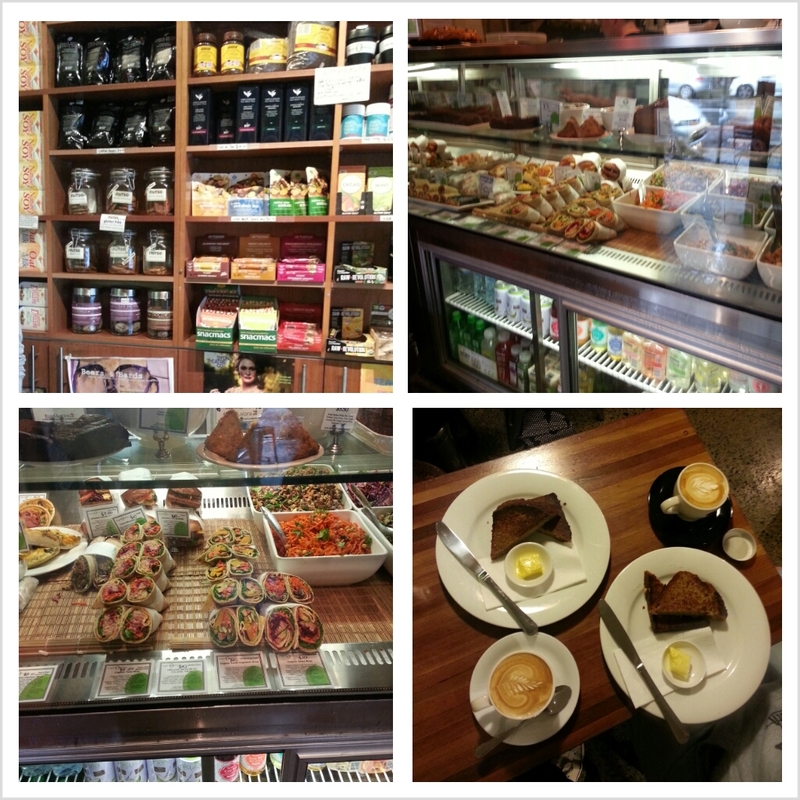 The coffee was smooth and the banana bread was served warm with butter and it really hit the spot. For the service received by the friendly and welcoming staff and the choice available to little old celiac me it is worth the price and the effort to find … I could not complain and I will return! I have to appologise for my lack of posting and I realise it’s somewhere near a week between posts, however, in my defense (and I write this as I have a very bad cold) it is proving rather difficult by phone. Also we have been using all of our free time to look for work…and getting a little tipsy, well we did come here to meet more people even if it is over a box of cheap wine! So, for a quick update to our family/friends and anyone else who is interested, I’ll tell you what we have been up to (starting with our transportation). 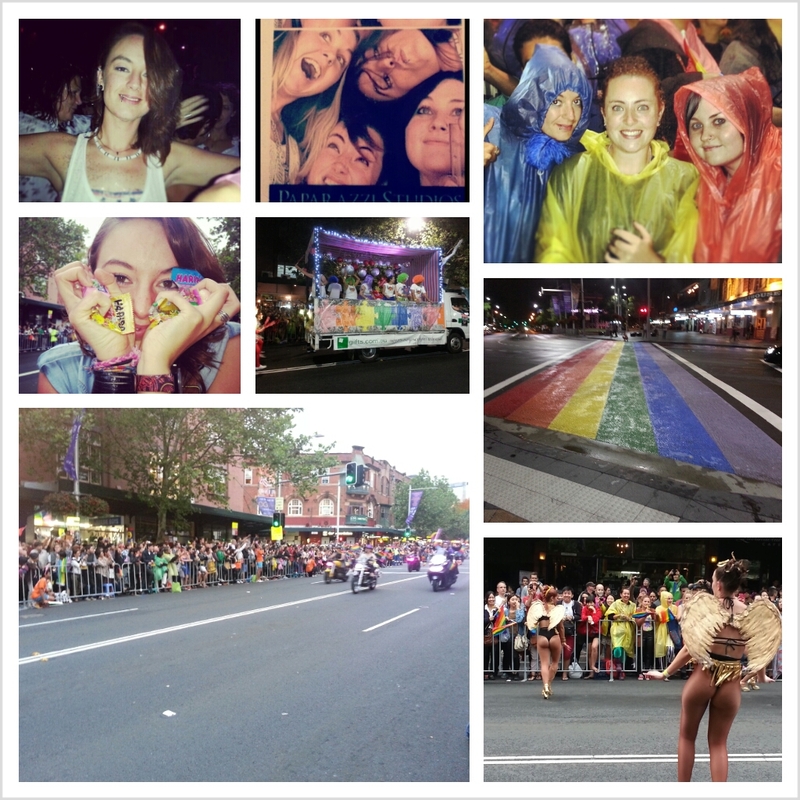 We had been in Melbourne for a few days and needed to make our way back to NSW, we had plans arranged for the Sydney Mardi Gras so needed a quick and cheap way to get back. We decided to go by night train, it would take 12 hours and save us some money on accomodation. We used our student cards and paid $136.88 and we had 20kg of checked luggage and 7kg of hand luggage. Now you’re probably thinking the same thing as I did, checked luggage? I thought that kinda rubbish was for planes only…well no it’s not. We got on the train and the seats had plenty of room and other than inconsiderate passengers and constant air con it wasn’t such a bad journey. The food car operated throughout the night except for one hour at staff changeover, they even had a range of gluten free cookies, muffins and sandwiches. How awesome! 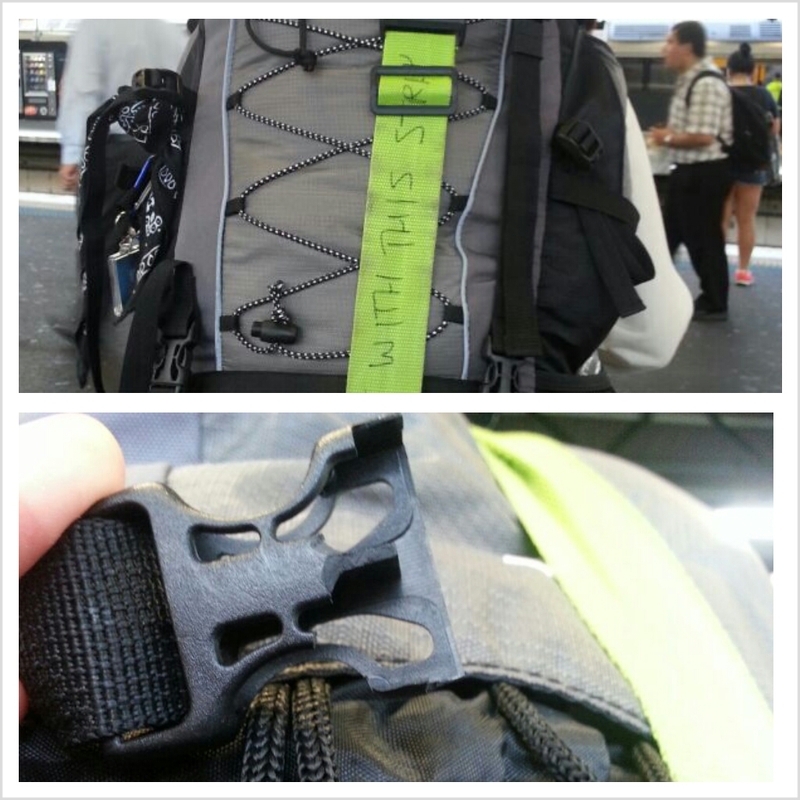 The problem arose when we had to switch trains at Strathfield, our bags were thrown onto the platform and true to our suspicions one of my clips had been broken on the secure strap to the front of my backpack. I was so annoyed What made it worse was that there are luggage compartments on in the carriages big enough for backpacks and suitcases. In actual fact we didn’t need to book our bags in at all, we found that out later on from staff. 2- if you must check in your luggage, use a rain cover (if your bag has one) and a luggage strap to remove the option for them to lift any other way.